The season for blueberries is long past, but if you managed to freeze some from your summer surplus or if you’re just lucky enough to find some out shopping, get those amazing fruits ready for a delicious breakfast you’ll want everyday! I have been a long time fan of oatmeal (hot or cold) for breakfast, but always disliked the hefty amount of gluten right at the onset of my day, so I’ve kept an eye open for a more protein-rich, gluten-free alternative. I’ve seen some people do creative things with mashed bananas and eggs, but I didn’t love the consistency in that style. Then I found this recipe on Pastry Affair for a quinoa-based hot breakfast and I felt hope. I made the recipe as it was and then replaced/added some things, but found myself going back to the original again and again. It’s really perfection. I did find that I liked chopped walnuts more than sliced almonds (they held their crunch a bit better than the almonds did), and I actually use 3/4 of a cup of almond milk and 1/4 cup water for a creamier texture, but those are my personal preferences. This is one of those wonderful year-round recipes that satisfies not just the tastebuds, but the body and soul. 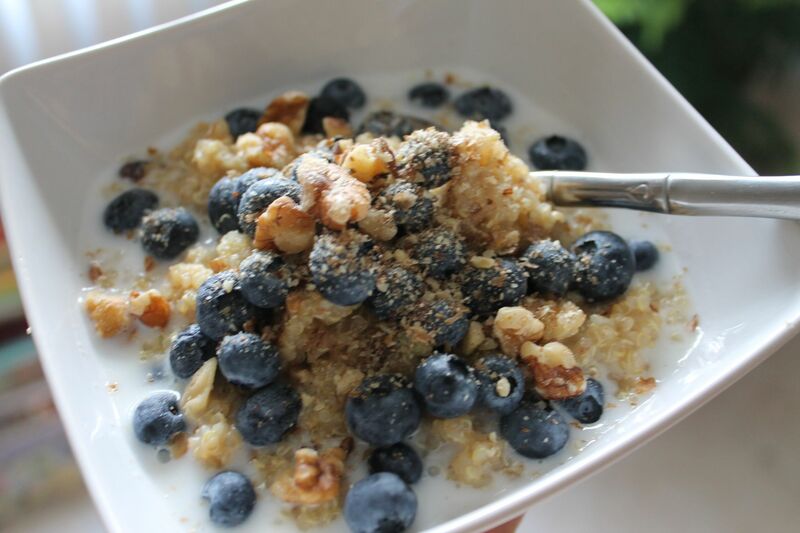 You get all the great nutrients from the quinoa and blueberries, with just a touch of added sweetness from the brown sugar. Meanwhile, the texture gives you something to do with the crunch of the nuts and even the quinoa. Eating it is an engrossing process. I’m working up some twists on this for fall, playing with my favorite flavors of the season such as pumpkin, apples, maples syrup and cinnamon, but so far this is still my go-to. Have your tried quinoa for breakfast? I love quinoa for breakfast and this sounds really good! I like it with almond milk, but I’m very naughty, and add butter. I feel like the brown sugar was my touch of naughtiness, so I’m not going to bust on adding butter! I was skeptical when I first made it, but it’s been total love-at-first-bite. Super recipe! It’s now my breakfast favorite. So glad you like it! I think it’s totally worth the time in the morning.